Samsung is going head-to-head with Motorola after announcing the Galaxy Tab 10.1, an Android 3.0 (Honeycomb) tablet almost identical in specifications with the Xoom. But Samsung's new 10-inch tablet will not only have to fight with Motorola's offering; HP is preparing to counter with its upcoming TouchPad and Apple's iPad is still the heavyweight of the 10-inch category. We all knew the battle for 10-inch class tablets was coming, but it's only now this battle is starting to take shape. Last year Samsung tried in an honorable effort to compete with the iPad by launching a smaller 7-inch Galaxy Tab tablet, yet the company made no firm retail figures available. This year though, manufacturers have clearly turned to the 10-inch form factor, which made the iPad such a popular device (over 14 million sold at last count). Samsung is the latest in line to introduce a 10-inch tablet, after Motorola and HP. 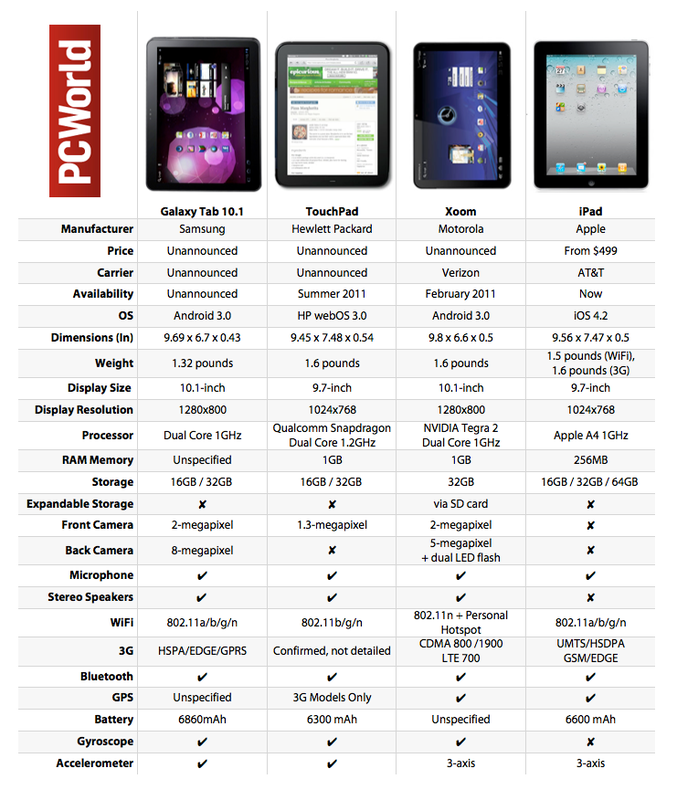 See how they stack up against the iPad by clicking on our tablet comparison chart. Stock Android 3.0 on both devices could mean that Google has not given Samsung and Motorola enough time to develop their own customizations for the tablets, which in turn could mean that Google is yet to put the finishing touches on Honeycomb (hence why no exact shipping date has been announced for the Xoom and Tab 10.1). The resemblances between the Galaxy Tab 10.1 and Xoom don't stop at the OS. Both feature a 10.1-inch screen with a 1280 by 800 pixels display, dual core 1GHz processors and front-facing 2-megapixel cameras. The Xoom has a 5-megapixel camera on the back, while the Tab 10.1 rocks an 8-megapixel camera. The Tab is also slightly thinner and lighter than the Xoom, TouchPad or the iPad. Meanwhile, the iPad has no cameras and the TouchPad will feature only a front-facing camera. While the Xoom will run on Verizon's network when launched, the HSPA/EDGE/GPRS chip inside the Tab indicates that Samsung's new tablet is headed to AT&T, the same network currently homing the 3G version of the iPad. HP said that it will have a 3G version of the TouchPad too, but initially a Wi-Fi-only version will be introduced. Carrier partnerships or subsidies have yet to be announced. Pricing is the biggest unknown with this latest batch of iPad competitors. Motorola, Samsung or HP did not say how much their tablets will cost; nor have they given an exact shipping date. The Motorola is widely expected to surface sometime in late February (or early March). Samsung was not able to undercut iPad pricing even with a smaller-screen tablet, so the chances of this happening with a more powerful and expensive to produce tablet are even slighter. Leaks point out that the Xoom could cost anywhere between $800 and $1,200, a whole lot more expensive than the $499 starting price of the iPad (though that price does not represent a feature-by-feature match). Finally, Apple is yet to have the latest word in the big tablet fight. The company is expected to announce a new version of the tablet, bringing improvements such as dual cameras, faster processor and more RAM and even a native Verizon version. If Apple manages to stick to the same price points introduced by the original iPad (and no other tablet undercuts it), then no matter how much more powerful competing tablets look on paper, they will stand little chance against the iPad 2. Which 10-inch tablet would you buy and why? Samsung's Galaxy Tab 10.1, Motorola's Xoom, HP's TouchPad or Apple's iPad 2? Sound off in the comments.